We have recently added a selection of recycled plastic playground equipment to our website. You may be thinking, "What are some good reasons to choose recycled plastic equipment?" Sustainability- It is good for the environment. By reusing plastic materials and turning them into these playgrounds the plastic is kept out of landfills. Safety- These playgrounds are designed with safety in mind. Not only are the safe on the environment, but they are safe for children! Materials used are non-toxic. Design Variety- You will not have to sacrifice on design or color just because these playgrounds are made from recycled plastic. 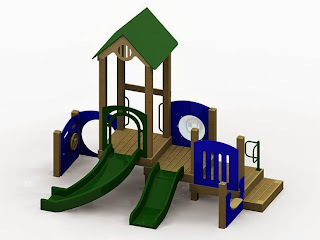 A wide variety of colors and playground designs are available! Quality- These playgrounds don't look recycled! The plastic used to create these structures still looks brand new, even though it is recycled. There is no loss of quality. To read our full article on sustainable playgrounds click here. To see our new selection of recycled plastic playground equipment click here.